MonArk Boat Company eventually grew to include a large recreational division that included both aluminum and fiberglass boats and manufactured a wide range of products including Ski Boats, Pontoons, Houseboats, Sail Boats, Canoes, and Bass Boats in addition to the basic jon boat that is still built today. At the height of the recreation business the company was building approximately 15,000 boats per year and had over 300 dealers throughout the United States. Soon after inception, MonArk was asked to build a boat with a small cabin for the Arkansas Game & Fish Commission and with this new product the Workboat Division was born. This side of the business continued to grow to include oil industry products such as pumper boats and crew boats and eventually included models for commercial and military use. The two divisions of MonArk were eventually located in different facilities just a mile apart from each other. The company created hundreds of jobs for the Monticello community and included customers in many countries around the world. In 1988, the Mercury Powerboat Division of Brunswick Corporation purchased the Recreational Division of MonArk Boat Company and along with it, the MonArk name. McClendon retained the Workboat side of the company and re-named it SeaArk Marine. Brunswick operated out of the Monticello facility for only about a year before relocating the operations away from Monticello. After the sale of the Recreational Division to Brunswick, McClendon continued to build commercial work and patrol boats for customers that included all branches of the United States Military, the U. S. Coast Guard, Municipal Fire Departments, the San Antonio RiverWalk and many Foreign Governments. 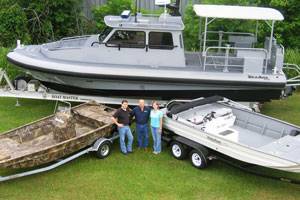 The SeaArk Marine product line includes patrol boats for harbor security, hydrographic survey boats, law enforcement craft, fire & rescue boats, and models for drug interdiction as well as many other types of craft for various applications. After a 4-year non-compete agreement with Brunswick Marine expired in 1992, Zach McClendon once again started building recreational products under the name SeaArk Boats. Claiming to build the “World’s largest Jon Boat” soon after, the company focused on building all-welded, heavy duty, aluminum hunting and fishing boats. Today, SeaArk Boats has over 100 dealers across the United States. Between MonArk Boat Company and the SeaArk Companies, boats have been shipped to over 70 different countries around the world. McClendon’s children now run the day to day operations of the companies. His son, John McClendon serves as President of SeaArk Marine and daughter, Robin McClendon is President of SeaArk Boats. Zach, at 72, is still very active in the business serving as Chairman of the Board for both companies and assisting with new product development and problem solving consulting. The official start of the Golden Anniversary Celebration will get kicked off at SeaArk Boats’ annual Dealer Meeting to be held this year in Branson, Missouri August 23-25. During this event, attendees will officially raise a glass in toast to commemorate the occasion and all Dealers will be given a Golden Plaque for their stores recognizing them as an Authorized Dealer of SeaArk Boats. The family is also planning a community-wide celebration on September 18 in Monticello, Ark. All members of the community, former employees, vendors, dealers and customers are invited. A short ceremony will take place at the SeaArk Marine plant followed by plant tours at both SeaArk Marine and SeaArk Boat facilities. The 50th Anniversary Celebration will conclude in New Orleans at the International Workboat Show in December.